It might not seem like music has much to do with cutting-edge physics at first glance. 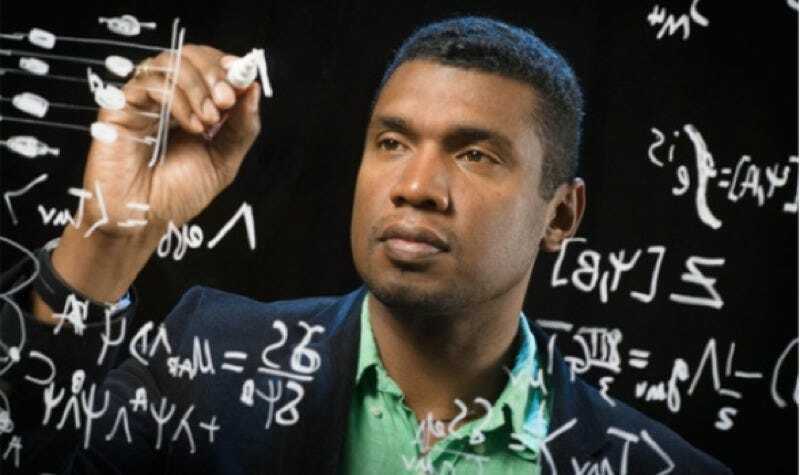 In his new book, The Jazz of Physics: The Secret Link Between Music and the Structure of the Universe, Brown University physics professor Stephon Alexander argues that using music as an analogy can shed light on some of the deepest mysteries in cosmology. Alexander is not your typical physicist. Born in Trinidad and raised in the Bronx, he developed twin passions for jazz and physics at an early age. As a graduate student, he played the saxophone in jazz clubs and mastered Einstein’s equations. It’s a unique perspective that informs his approach to both; for instance, he views John Coltrane’s seminal Giant Steps album (1960), with its trademark “sheets of sound,” as the “sonic equivalent to Einstein’s bending of the space-time fabric.” Gizmodo caught up with Alexander to learn more about this hidden link. Gizmodo: In some sense, this is the perfect timing for a book about the jazz of physics. There’s a lot of interest in sonification—turning raw scientific data into sound—both for creating unusual music, and as a unique means of spotting elusive patterns in the data. The LIGO collaboration just detected gravitational waves and turned that data into an audible “chirp.” We’re now listening to, as well as looking at, our world. Stephon Alexander: Exactly. I believe that by reconnecting the disciplines of physics and music though analogy, we can begin to understand physics through sound. The universe has sound waves: harmony and resonance are universal phenomena that can be used to explain the dynamics of the early universe. When you hear it, it doesn’t sound musical. But [with sonification] you are informing that raw sound data with the question of the science at hand, and you’re using that to guide you to something new. Then there’s the reverse of that. From a musical perspective, I can take my understanding of the physics of the cosmic microwave background radiation, for instance, or the raw sound map that we get from the WMAP data [from NASA’s Wilkinson Microwave Anisotropy Probe], and tweak that to make it musical. I’m working on a jazz album right now using some of the concepts in the book. You write about how models of neural circuitry in the brain ended up informing your research on superconductivity and the large-scale structure of the universe when you were a graduate student in Leon Cooper’s group at Brown University. That’s a strong argument for understanding the math: it can reveal hidden corrections. Alexander: It’s at the heart of my book. You see the wave equation in string theory, you see it in the cosmic microwave background radiation, and you see it in a guitar string. That equation applies to all these very different things that seem to have nothing to do with each other. The math is the connective tissue. There’s an intuitive aspect to physics; sometimes you have to make these crazy leaps. One of the thing I do [as a physicist] is try to make connections between things that people never thought to connect. If there’s something to it, the math will tell the truth. Some hidden equation will connect those things. String theory in particular seems to resonate with people because of the musical analogy: our universe is “composed” of these tiny strings that make up matter at the most fundamental scale, and the different ways that they vibrate determine the properties of elementary particles and fundamental forces. As you say in the book, it’s like a scientific “music of the spheres.” But string theory has also run into some serious issues in recent years. Alexander: It’s run into a multiverse of issues. I would say that string theory has gotten postmodern. Old string theory is to bebop as new string theory is to freeform. If it’s going to be a true theory, it must accommodate the fine-tuning problem. For the benefit of our readers: there are about 30 numbers (called fundamental constants) that define the masses of elementary particles and the strength of the four fundamental forces. They have well-defined values, but change just a few of those numbers—even a little—and the universe would be a very different, far less complex and interesting place. And physicists don’t really know why those numbers have the values that they do. That’s the fine-tuning problem. Alexander: Right. In jazz music, the whole point of improvisation is that you push the tradition. That is the tradition. Miles Davis, Ornette Coleman, and Coltrane were always pushing the boundaries. So let’s accept that string theory is a musical theory. How can we put improvisation into it? I came up with this idea that the universe is like an improvisational system. There’s a cyclic universe [i.e., the universe regularly undergoes repeating “cycles” of big bangs and big crunches]. In that scenario, the coupling constants of nature are improvised, the same way that a jazz soloist improvises and gets a chance every cycle to get a different take on the improvisation. This forces string theory to break one of its own rules: it doesn’t allow these things called “ghost fields.” [Editor’s note: in theoretical physics, the term “ghost” applies not to any supernatural phenomenon, but to an object that can be useful for calculations yet has no real physical meaning.] But if these coupling constants have to improvise, you need a ghost field. So to make string theory accommodate improvisation in the universe, the theory needs to be pushed beyond its own boundaries. It’s risky to push boundaries, though, particularly when it comes to the more speculative aspects of 21st century cosmology. Do you ever worry that you might be veering off on the wrong track? What if you make a mistake? Alexander: I only get worried in my research if I’m not making mistakes. That’s usually a sign that I’m not onto something interesting. I’m not pushing as hard as I should be. Again, there’s a metaphor to jazz: to improvise means to embrace making a mistake. So you play a wrong note. So what? I had a music teacher once who was supposed to be giving me advanced lessons. Instead, he gave me a pattern of four notes to play in every key. I’m like, “What the hell are you making me do this for, man?” And he said, “Just get this under your finger. Like a dancer or acrobat, you will fall, you will play the wrong thing. That’s the whole point. This teaches you how to fall.” A good improviser is constantly falling, and then transforming that into a different pathway that’s interesting. There has been much discussion of the need for greater diversity in physics, which is traditionally dominated by white men. Your success is evidence that the field is starting to change, but what else can physicists do to broaden their ranks? Alexander: There’s certainly pressure out there to fit into a certain mold. We need to realize that the mold is kind of illusory. We could learn from other successful intellectual traditions. Jazz music is an American art form, and a big part of the driving force behind it was its inclusivity. What happens if someone says something stupid in front of a group of very smart physicists? What you don’t want to do is crush them. You want to inspire them to go rethink things and come back stronger. There are souls out there who have a natural, intuitive talent for physics, but are not told that. I was one of those souls. The jazz tradition, and being mentored by musicians, is what kept me afloat in my pursuit to become a physicist. We tend to put precedence on one particular mode of thinking in physics, and we think that’s what a physicist is supposed to be. I’m trying to give more exposure to certain physicists who had different modes of thinking—people like Leon Cooper. Because some of my brightest students did not talk like the characters from The Big Bang Theory. In my book, I talk about improvisation as a means by which physicists can engage in the unknown. Whether physicists know it or not, they’re improvising with their equations and concepts. There’s an inclusive space that they create for each other—and maybe don’t create for other people. Inclusivity is more explicit in the jazz tradition. It’s about allowing somebody to make a mistake on stage, and you hold the space for them, creating a structure so that wrong note sounds right. The field of physics can grow even further if we become more like Miles Davis, Charlie Parker, and Thelonius Monk—creating a space so that everyone can jump in and be part of the conversation.